Linn Cove Viaduct is a 1,243-foot (379 m) concrete segmental bridge which snakes around the slopes of Grandfather Mountain in North Carolina. 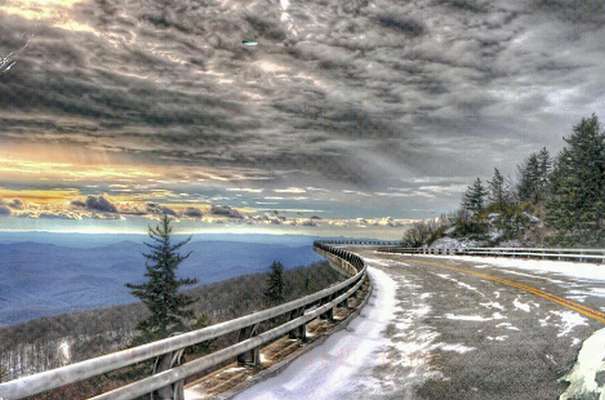 It was completed in 1987 at a cost of $10 million and was the last section of the Blue Ridge Parkway to be finished. The viaduct was needed because of the damage that a traditional cut-and-fill road would have caused to Grandfather Mountain. The viaduct was designed by Figg and Muller Engineers, Inc.; construction began in 1979. It is 1,243 feet long and consists of 153 segments weighing 50 tons each.